One of the most exotic and alluring stones in the world is actually a combination of two stones in one. An extremely enticing stone, Ametrine combines two different stones, Amethyst and Citrine. While Amethyst and Citrine are both forms of quartz that often derive from the same location, it is unique that both colors are found in the same stone. 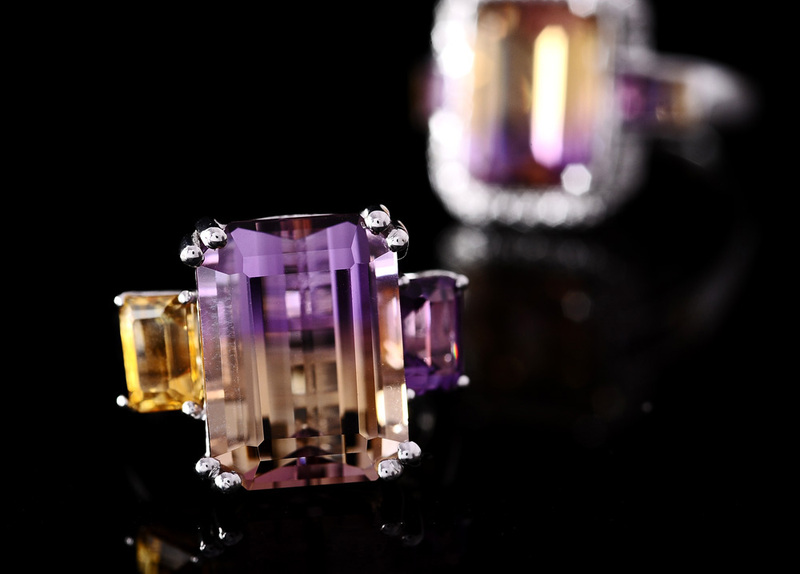 With the variety of quartz that Ametrine contains, the stone shows a fascinating natural effect called color zoning. While one of the most unbelievable aspects of this stone is that no two stones are alike, the legend surrounding the stone is most memorable. Legend tells of a Spanish soldier exploring Bolivia, who made contact with the native Ayoreo tribe. The daughter of the chieftain, named Anahi, fell in love with the soldier and asked for permission to marry him. The chieftain agreed and gave as his dowry to the soldier, a mine that produced a beautiful two-colored gemstone. Deeming the stone not as worthy as other gemstones, the soldier took no notice of it. The soldier eventually attempted to return to Spain, which the tribe saw as a sign of abandonment. Anahi was torn between loyalty to her people and her love for her husband. She discovered a plot to murder her husband to prevent their departure, so she warned him to flee. During a confrontation, however, Anahi was mortally wounded by her tribesmen. As she lay dying from her wounds in her husband’s arms, she placed into his hands a beautiful stone from the mine, telling him it was a token of her eternal love. When he opened his hands, he saw a beautiful purple and honey colored gem. To the soldier, the gem symbolized Anahi’s love, torn between both her husband and her people.